When analyzing your data, there are key questions you need to answer. Questions like how, who, where, why, and when can involve a lot of information. This recipe will show you an easy way to display when traffic is heaviest in one compact chart. You can also use this report to look at other usage data over time, such as calls received or support tickets created. Note: This recipe uses a Google Analytics connection, but you can use any connection containing a timestamp attribute. For information on connecting to data sources, see Adding connections . This section will discuss creating your calculated metric and adding data to your report. This recipe analyzes results by weekday, so time periods are measured in weeks. You can use other time periods in your reporting. Connect to your data source (see Adding connections ). In the Query Builder, click the + button on Columns. Select your HOUR(Date) attribute from the drop-down list. Open the Date period menu ( ) on the right panel. If you're not using a Google Analytics connection, see Adding and editing dates . Enter the following date ranges. 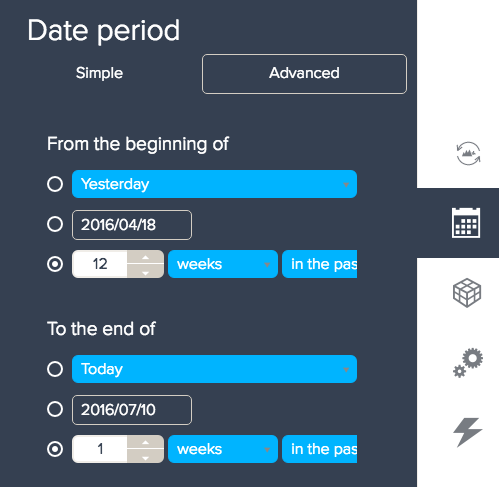 If you're using a different time period, enter your date ranges instead. From the beginning of 12 weeks in the past. To the end of 1 week in the past. In the Calculation engine menu ( ), select Standard calculated metric . Enter the integer 1 as the formula. This calculated metric only requires the number 1. Click the + button on Metrics, then select your calculated metric. Click the + button on Rows, then select Weekday. If you are using different time periods, select the date attribute you are analyzing results by. Click the color-encoding icon ( ) on Metrics. Select the metric you would like to analyze. This recipe uses Sessions to compare traffic on different days. Your chart will automatically appear as a line chart. The next section will discuss configuring your report as a heatmap. To easily compare multiple types of data in one chart, you can create a heatmap . A heatmap will help you identify outliers and evaluate the overall average of your results. In the Visualization type menu, select the table chart. In the Chart configuration menu ( ), select Columns . Check the Metrics on rows box. 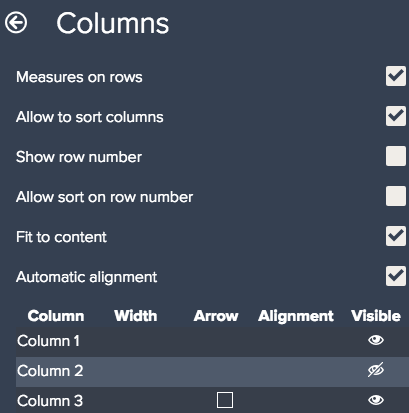 Click the eye button for Column 2 to hide the second column. Click the back arrow to return to the main menu. For Text Style , enter 0 as the text size. Select Colors > Color encoding to customize the color gradient for your metric. This example uses a white-to-dark gradient to clearly identify the high and low results. 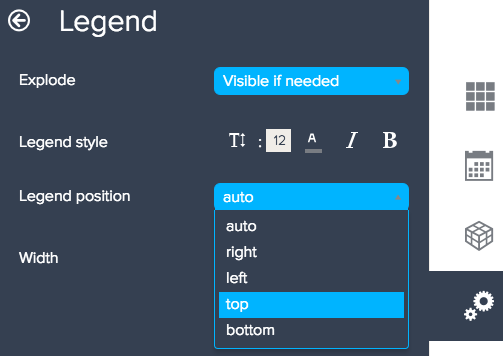 In the Legend position drop-down list, select Top . It is optimal to place your legend at the top, so your viewers can easily see the scale of your report. Check the Inline layout box. You have now created your heatmap report. In this report, you can use your rows to compare the activity by day, columns to compare activity by hour, and the entire chart to identify the highest and lowest results.